Let me tell you we are trying hard (and succeeding) in making that dream a reality for a lot of folks. We were able to put 1 house, 2 lots (with another contract being created) under contract over the past week. We also closed on two Lake Keowee lots and a house. Them’s summer time numbers! The hope is we can have a few more weekends like that before the end of 2018. Sales should remain pretty good until November then we expect a burst of activity around Thanksgiving and Christmas. Keep your fingers crossed. We’ll be out here pushing hard and making dreams realities! Tip #21, Find out when the buyer would like to close. When a buyer would “like” to close is often when they need to close. Knowing this gives you his deadline for completing negotiations – again, an advantage in negotiations. Clemson University forest ecologist Don Hagan said the 2018 fall color season will be brighter than 2017, even with the risk that Hurricane Florence posed in the region, The higher elevations will slowly move down the mountains. While Hurricane Irma wreaked havoc on trees in the Upstate and Western North Carolina last year, focing leaves to fall ahead of their annual display, Hurricane Florence doesn’t seem to have impacted the region as harshly. 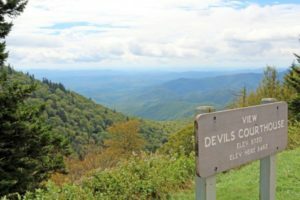 Clemson University Forest Ecologist Don Hagan, who has been predicting fall foliage for six years, headed up to Devil’s Courthouse in the Pisgah National Forest last week to assess the damage. “We didn’t see the direct impacts here along the southern Blue Ridge Parkway like we could have seen,” Hagan said.